Attractively furbished, Soundfront cedar shake bungalow has been completely renovated with all the comforts of home. What a location! Located right on the sound on calming Bay Drive. Delightfully landscaped with your own pier and boat mooring. The furnishings and decor are calming. Includes stainless steel appliances, wood floor and flat screen tv's. Screened porch for morning coffee or evening libations while you watch the colorful Carolina sunsets. Giant outdoor space with a hot tub and outdoor space furnishings. Great for sunbathing and star gazing. The four legged member of the family is also welcome with tons of fenced yard to romp in. Great access for kayaks or canoes. 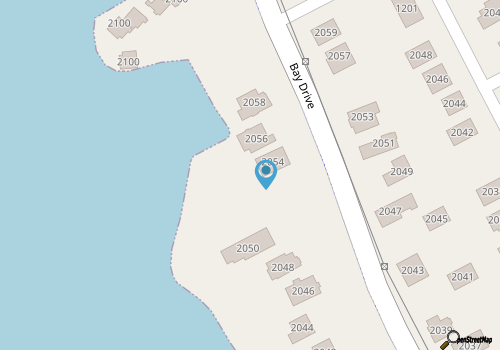 A few homes down is the community boat ramp for bigger boats with a mooring just off the pier for your boat. Your own dock is great for family fishing or crabbing. Close to grocery stores, eateries, shopping, putt putt and movie theaters as well as local attractions like the Wright Brothers Memorial and Jockey's Ridge Sand Dunes. Make A Change in Latitude your Holiday Home and let the Memories begin! Outside: Private Pier w/seating, Boat Mooring, Enormous Furnished Sound Front Deck with Hot Tub, Furnished Sound Front Screened Porch w/Ceiling Fan, Grand Fenced Sound Front Yard, Outdoor Shower, Tiki Bar. One Level: Kitchen w/Stainless Steel Appliances (Microwave, Range/Oven, Dishwasher, Fridge w/Icemaker), Dining Area w/Seating for 6, Great Room w/46" Flat Screen TV and DVD, King Master Bedroom w/40" Flat Screen TV and DVD, Queen Bedroom w/40" Flat Screen TV and DVD, Pyramid Bunk Bedroom w/Flat Screen TV and DVD, Sunroom, Washer & Dryer, Ceiling fans in every bedroom/Great Room/Sunroom. Linens: 1 Master w/King, 1 w/Queen, 1 w/Pyramid Bunk. Guest Linen Option.